Vascor is a Pennsylvania corporation founded by M Stephen Heilman and co-workers, who in cooperation with Michel Mirowski, developed and brought to market the worlds first implantable defibrillator. 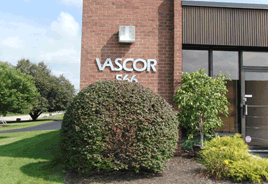 Located 14 miles northeast of Pittsburgh, Vascor occupies a 12,000 square facility within a modern industrial park. Vascor has the electronic, mechanical and software development capabilities necessary to develop and produce implantable devices. Vascor has explored numerous heart assist methods including magnetically suspended turbine pumps. But, because of the rotary pump related blood shear, Vascor has chosen a VAD design that uses a small pusher plate pump that connects to the descending thoracic aorta and assists the heart/circulation by means of the well-known counterpulsation principle.